An exterior deck is an addition to your home. Most room additions are considered “building up” while a deck is “building out.” Even with fine quality materials, decks are generally less than half the cost of an interior addition. A deck often serves the purpose of providing an area to relax, cook, dine, and entertain guests. A deck is similar to a patio in several ways, but the main distinction is that a deck is usually elevated, and made of wood or composite materials, while patios are at a ground level and are often made of stone or cement. Decks can be attached to your home or detached. Either way, a building permit is generally required for this type of upgrade, which means a site plan would benefit the project and/or be required as part of the permitting process. Planning for a new deck construction helps ascertain costs, materials and layout that you’ll go with. Let’s overview the costs, the price breakdown and advantages along with disadvantages of an exterior deck. Building a deck is labor intensive and takes experienced contractors between one and three weeks to complete the job. While a handy person might be tempted to go the DIY route, it is not recommended. Decks must be ultra sturdy. All floor boards benefit from being exactly even. Modern decks make room for electricity and plumbing that are well-hidden. Pricing is done on a square footage basis. And the price range can be wide, between $4 and $25 per sq. ft. for materials. A professional crew will usually charge $4 to $15+ per sq. ft. for all labor involved. While a professionally installed deck can cost as little as $8 per sq. ft. for materials and labor, the average cost is actually closer to $35 per sq. ft. If you are looking to save on costs, then the best advice is to lower the overall size of your deck. Materials are the main cost, aside from labor, for pricing a deck. When talking about a deck’s material, say a pressure treated wood deck, it is the floor boards and trim that are being referenced. There are essentially three main types of materials that homeowners select from: natural wood, pressure-treated wood and composites (or plastics). Natural wood runs the gamut in terms of costs. Cedar is the least expensive decking material (about $4 per sq.ft. ), while exotic woods like Brazilian wood (aka Iron wood) at $25 per sq. ft. is the most expensive material. Pressure treated wood is a very common decking material that costs about $10 per sq. ft., while the composite materials, like PVC, cost about $9 per sq. ft.
6 – Building stairs – as most decks are elevated, stairs are built from deck’s surface to the ground. Building stairs is fairly labor intensive. 7 – Installing floorboards – this is the primary decking material from homeowner perspective. Depending on materials used, floor boards and trim may be sealed and made waterproof. Sealing protects from weather elements, while waterproofing makes it so water beads up and rolls off. Sealing and waterproofing costs about $350 for every 250 sq. ft. If natural or pressure treated wood is used, it is often stained. This includes a light sanding and then spending about $2.50 per sq. ft. A red cedar deck or pre-finished composite deck doesn’t need staining. Then comes the part where the deck is made into a livable area. Adding lounge furniture, chairs, seat cushions/pillows, dining table, throw rug, plants/flowers, fire pit, sound system, lighting, storage bins, and possibly more. Obviously any cooking or fire pits must be used with extreme caution, away from your home’s exterior walls. Labor and materials are the primary factors that impact the costs in building a deck. Everything up to installing floor boards will have a specific cost that can be determined during the planning stages. Railings can add slightly to overall costs, or can be ornamental and therefore add a chunk of change to the price. 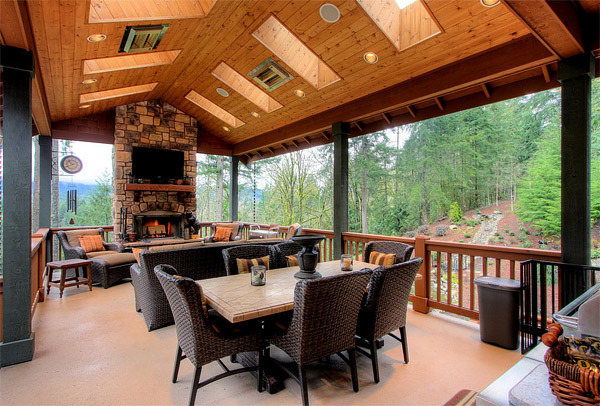 Turning a deck into a nice, or luxurious living space will further increase costs. How much, depends on how ambitious or creative you wish to get. Keeping this to under $1,000 and having many conveniences on a deck is certainly possible. Though taking a look, hopefully for inspiration at the Pinterest page for backyard deck design, and you’ll see how costs can easily exceed $1,000, after the construction is all done. One item you’ll see in the above images that we didn’t previously mention is the construction of pergola. This is an open-frame shelter that surrounds and covers the deck space. 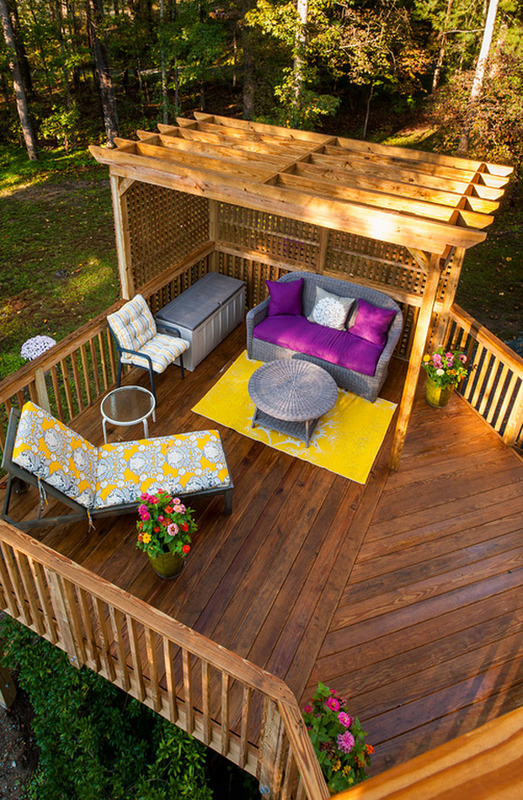 It adds character with the option of adding temporary materials that shield your deck from light or inclement weather, while providing a tiny bit of seclusion. Below we list the pros, cons, and the chief reason for why to consider an exterior deck. The Good: Decks offer additional, livable space to your property. For a homeowner, their primary purpose is enjoyment or a place to relax and/or entertain guests. The Bad: Mid size, medium quality decks are expensive and for some an unnecessary luxury. Compared to a patio, they are very expensive. Depending on the material you choose, they can require ongoing maintenance and thus additional expense.